Please see Install Oracle Java In Debian/ Ubuntu using apt-get for more information. Docker is an up and coming virtualisation technology utilising Linux Containers (LXC) to provide a private and consistent working environment across all Docker installations. Docker aims to create portable templates which can be created and distributed to run on any Docker enabled host. Docker works on a similar premise to OpenVZ and is therefore limited by the same constraints, such as only Linux guests can be created in Docker as each guest shares the hosts kernel. Installing Docker on Ubuntu couldn’t be easier since version 14.04 of Ubuntu saw the Docker packages available through the standard Ubuntu repositories. Create a symlink to the Docker executable so that the Docker documentation commands can be executed without changing the path. This is required because the Ubuntu package for Docker is installed to a different directory to the default Docker recommendation. And that’s all there is to it! You now have a working Docker environment. See my next blog post for Creating your first Docker container. 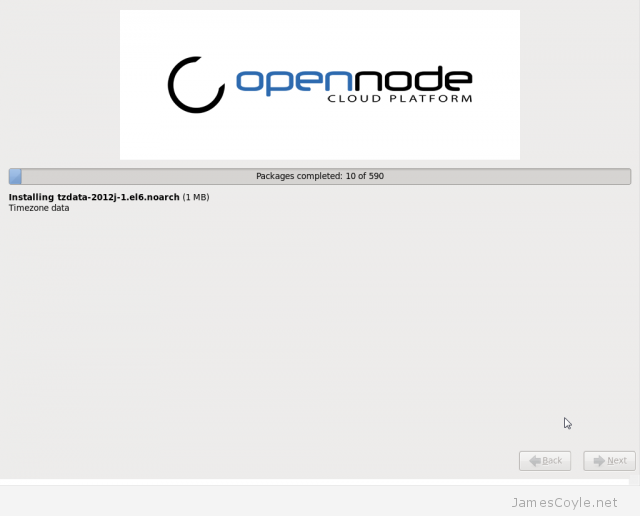 Installing OpenNode is much like installing any other modern Linux distribution. You start with a text based installer to configure some of the basic options, such as netwokring, then you are presented with a GUI to complete the install. Download the ISO from the OpenNode website and burn it to a CD, or mount the ISO on your virtual machine. The first screen you wil see when you boot the install CD is the boot menu. Press ENTER to start the install with default settings. You can use advanced boot options which are coved on my other blog post. You will now need to specify your network settings. Move around this screen using the arrow keys and pressing SPACE on the item to enable. You will notice an asterix (*) next to each item which is enabled. 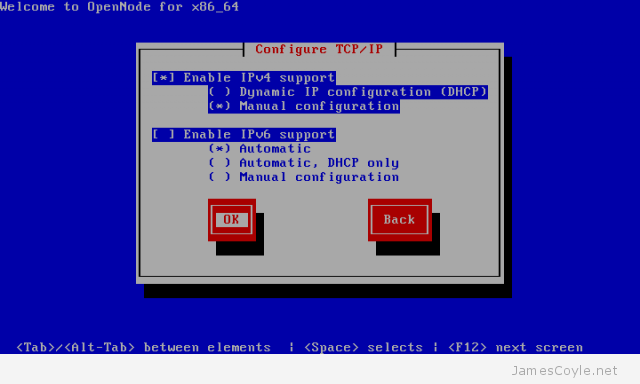 Select Manual Configuration for IPv4 and disable Enable IPv6 support. Now enter your IPv4 address, submask, Gateway and Name Server (DNS server) for your network and press TAB to select OK.
Press 1 and ENTER to use the default file system layout. Press ENTER to confirm the changes and commit them to disk. The GUI will now load and you can use either your mouse or keyboard to navigate the screen. Select your language and press Next. Type in the Hostname for your machine to use and press Next. 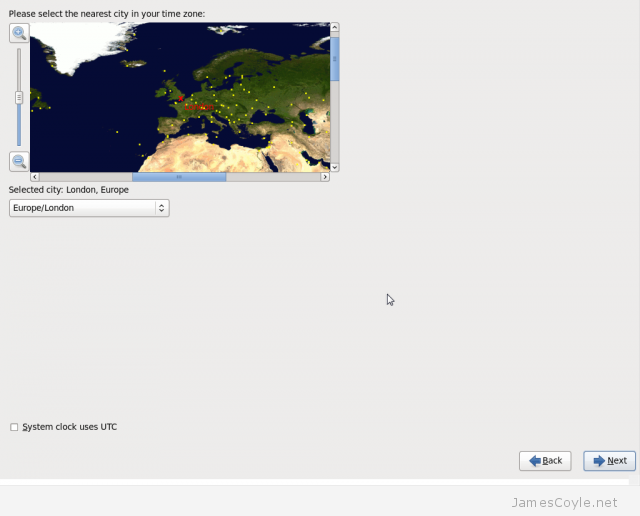 Choose your timezone by clicking areas on the map and press Next. Enter the Root Password for your installation to use. This is the password you will use later to log into the system. Press Next and the install will start. Once the installation completes, click Reboot to reboot your machine and boot from your new installation. You will be presented with the login screen when your machine restarts. Log in with root as the username and the password you set in the earlier install step. Now your install is complete and your OpenNode system is ready to be used. Before creating any VMs, it’s best to update your system using yum to make sure you have the latest bug fixes and security patches installed. Run the yum command to download and install the latest updates of all your installed packages. The yum application is downloading the latest list of available software and will update them once you have confirmed that you would like to proceed. Press y and ENTER to download and install the latest version and their dependencies of your installed packages. The first time you run yum update you will get warning about importing the GBG key. Press y and ENTER to accept. Finally, you need to reboot to make sure all the new packages are used. Issue the command reboot at the prompt. 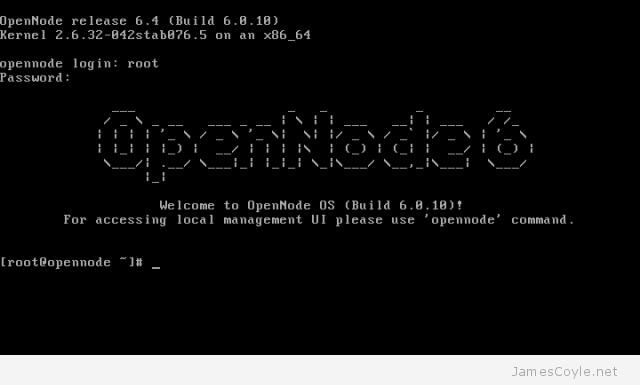 Wait for the operating system to load and you can start to use your new OpenNode installation. To get started, log back in and issue the command opennode to get started. OpenNode does does not have a web based GUI installed by default. See my other blog post on setting up the web based GUI. Although installations of Proxmox usually go smoothly, sometimes you may have problems detecting storage arrays or other hardware. By default the installer doesn’t give much away about any problems, so in the event of a problem you need to enable debugging. 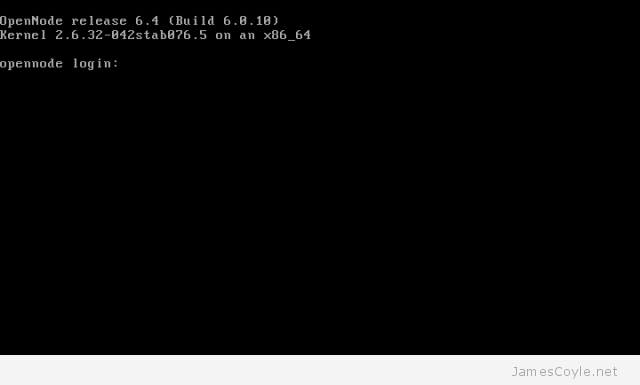 To enable debugging, you will need to type debug at the installation boot menu. You can mix this with other arguments to over ride the defaults. See Advanced install settings for more information. You will then be taken to a console where you can run any pre diagnostic commands. Press CTRL + D to continue the installation once you have finished with the terminal. If the installer errors, click Abort to return to a console. 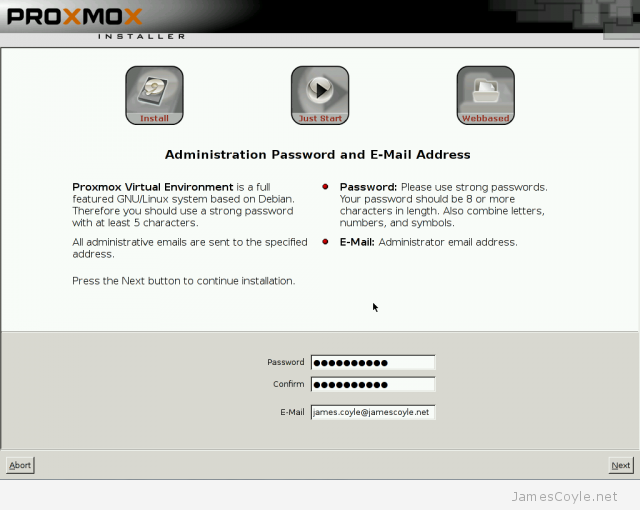 Installing Proxmox is quick and easy – the installer GUI takes care of everything, such as installing the correct packages and partitioning the root hard disk. On more advanced installs, there may be a need to override some of these options. For example, you may want to specify how much swap space is created, or the size of the root partition. On one of my installs using a 120GB disk as the install device, 28GB is used for my root (/) partition on a default install. As I only run the basic, required packages on the host this size is far too large. With larger disks the problem gets worse. 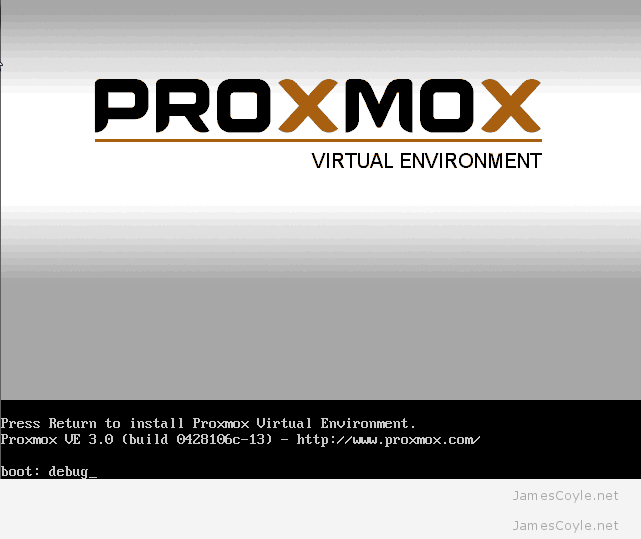 When installing proxmox, the first screen of the installer is the Boot menu. At this prompt, we can specify arguments to override the defaults. The above example linux ext4 maxroot=10 swapsize=20 sets the partition format to ext4 (ext3 is the default), creates a root partition of 10GB providing the disk is large enough and swapsize of 20GB. 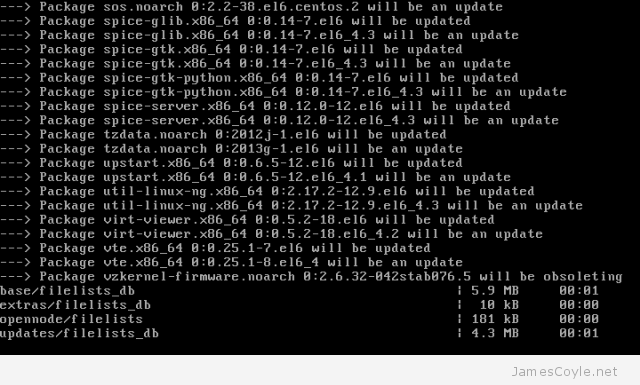 linux ext4 – sets the partition format to ext4. The default is ext3. hdsize=nGB – this sets the total amount of hard disk to use for the Proxmox installation. This should be smaller than your disk size. 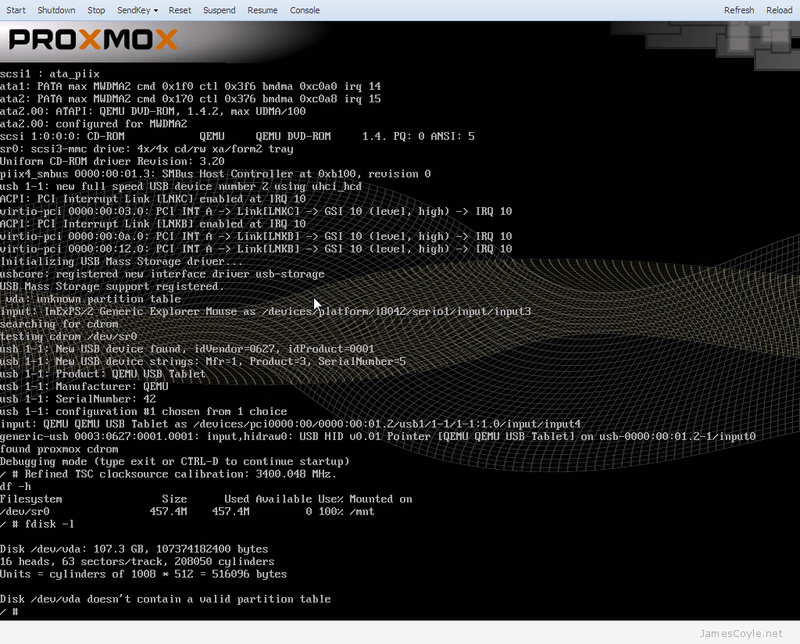 maxroot=nGB – sets the maximum size to use for the root partition. This is the max size so if the disk is too small, the partition may be smaller than this. swapsize=nGB – sets the swap partition size in gigabytes. maxvz-nGB – sets the maximum size in gigabytes that the data partition will be. Again, this is similar to maxroot and the final partition size may be smaller. minfree=nGB – sets the amount of free space to remain on the disk after the Proxmox instillation. Proxmox is a hypervisor which can host hardware virtualized virtual machines as well as OpenVZ containers. See the OpenVZ wiki for more information on containers and how they differ to the hardware virtualisation environments. Use the below URL to find and download the latest version of Proxmox ISO. You will then need to burn the ISO to a blank CD or DVD. Make sure the CD Rom is in the CD tray and turn on your computer. You must have the CD Rom as one of the first bootable devices which can be set in your BIOS. 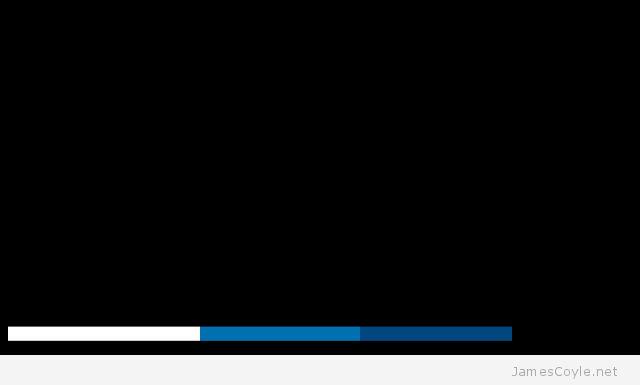 When the installation CD loads, you will be presented with the below screen. Press Return to begin loading the installer. 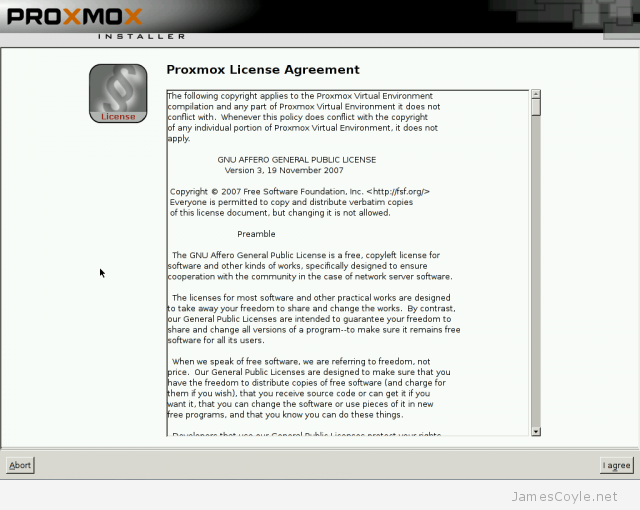 The next screen is the License Agreement. 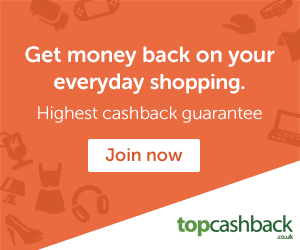 Click on Accept to continue. If you only have one hard disk in your machine, simply click Next at the below screen. If you have more than one disk, select the disk to install Proxmox to and click Next. 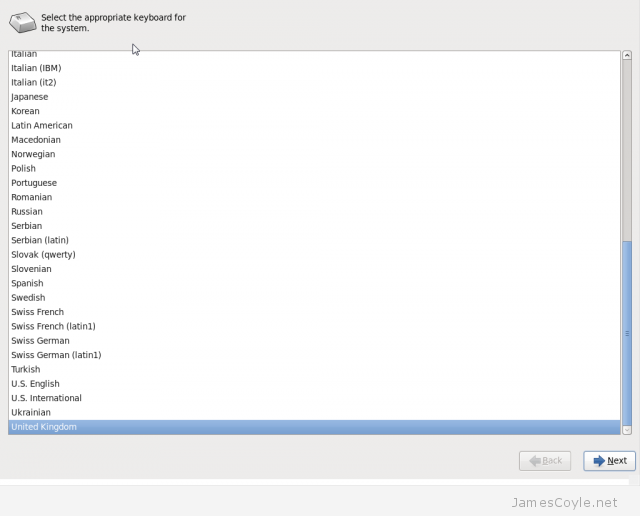 Enter your Country which should set your Time zone and Keyboard layout to match. Then click Next. Enter a Password for the root account and E-Mail. Then click Next. 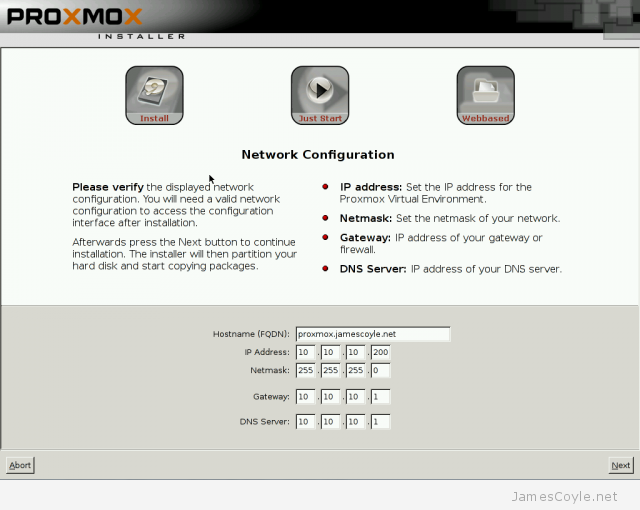 Enter the Hostname (FQDN) for the proxmox server as well as the IP Address, Netmask, Gateway and DNS Server. If you have DHCP on your network, these settings will be filled in with values from the DHCP server. 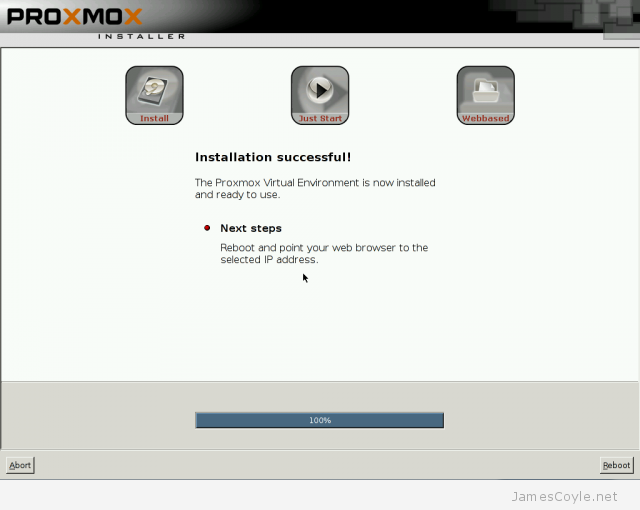 Click Next to begin installing Proxmox. 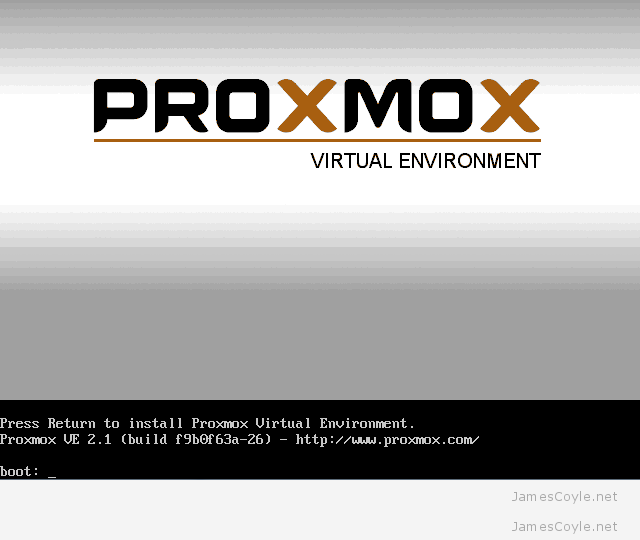 When the install completes, click Reboot to restart your machine and complete your Proxmox install. When your server has rebooted you will be sent to the login screen. 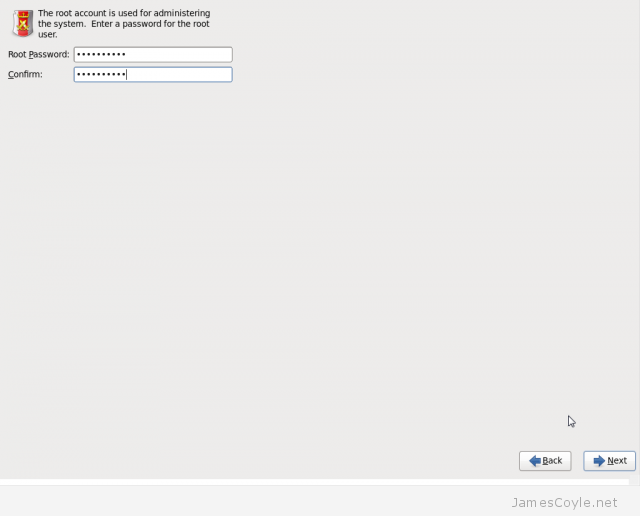 Here you can use the account root and the password you entered during the installation. 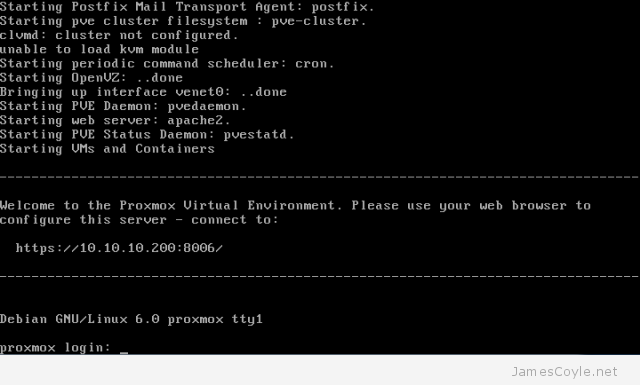 Congratulations – your Proxmox server is ready to use. 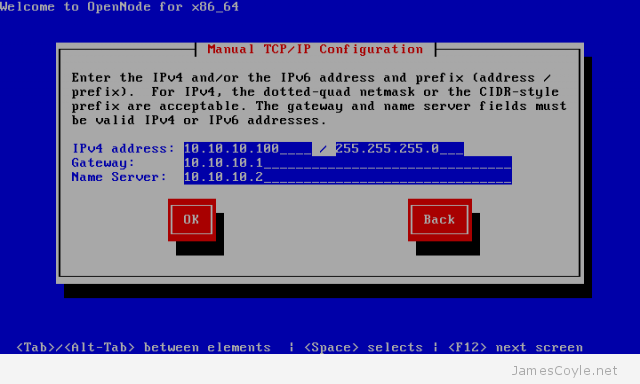 You can access the web interface using the IP address you entered during the installation, https and port 8006.